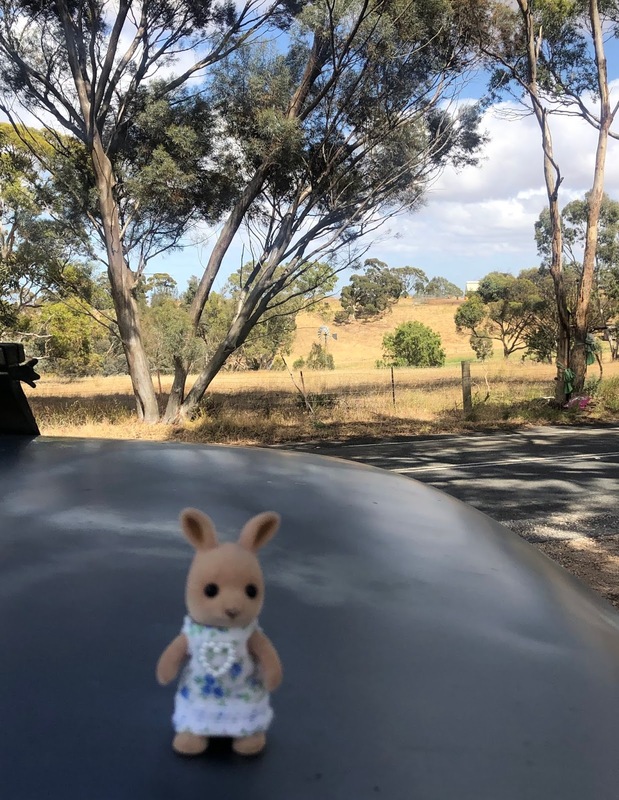 Joanne was out enjoying the countryside today. I know it has been quite some time since anyone has heard from me, but now I write with great news! 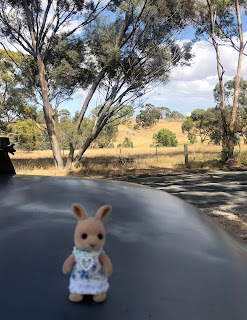 Joanne the travelling Sylvanian is here for a couple of weeks. 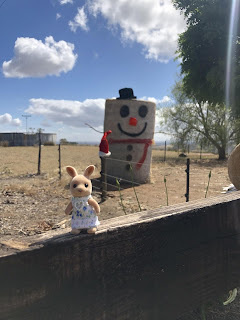 Joanne was met by her cousin Wirra Kaurna (pronounced Gana), who took her to meet The Billabong family, Wirra's adopted parents & where Joanne would be living during her stay in Slydale Hollow. The Billabong's live in a communal tree dwelling with the Outback koala family & the Totto monkey family. Wirra also introduced Joanne to her sister Mathilda Billabong, who is about the same age as Joanne & Wirra. while settling in Joanne met some of the other residents. "Joanne, you can set up your SWAG here" said Wirra. When set up was done the girls wanted to take Joanne to explore more of Slydale Hollow, so they went to their mum to ask if they could. "YAY" shouted the girls & off they went. Wirra introduced Joanne to everyone. Joanne, was pleased to meet them all, including Bramble the pony who pulls the caravan. Little Skitter was so excited he tried to jump into Joanne's arms! And not wanting to be left out, strawberry the foal pushed in for a pat! Everyone was having a great time! But then Mrs.Babblebrook showed up to bring Breezy home. Went she saw Joanne, she immediately invite the girls to all come over for a little while & play. At the Babblebrooks house Breezy's siblings were all having playdates with friends. Mrs.Babblebrook laughed & said "The more, the merrier I say!" Breezy, Scarlette, Mathilda, Wirra & Joanne all went upstairs to play in Breezy's room. Soon it was time for the girls to head to their homes. After a long day of meeting new people & exploring Joanne bounced into her bellroll/SWAG excited for the coming days, but also a little homesick. thinking thoughts like "my family would have loved it here."' & "I do miss my family a bit"
Mrs.Billabong came to tuck the girls in & kiss them goodnight. "Joanne, I don't know how much you know about native Australian culture, but here at bedtime it's customary for the grownups to tell the children stories of the Dreamtime, stories that our ancestors told their children. So now I'm going to tell you some..."
New & bigger mole/Rabbit house. I decided to build I bigger mole house & then my son had the great idea of adding a rabbit hole in the top. It was quite a good idea as it lets in more light. Today I added the final touches, wallpaper & furniture. It look very cosy doesn’t it! This one even has a flap on the back that you can close. They greet everyone in the town with a hello. A nice dress designer working in Town. I'm always thinking, "I'd like to have a nice presentation of time when I was wearing a dress." The big rose flower bouquet is a gift from a cinnamon rabbit brother. Fortunately walking hand in hand are the wonderful couple of dream weavers in the town. Next to original “Stella” ie. Chocolate Rabbit Older Sister. These can “hold hands” with their special made paws. 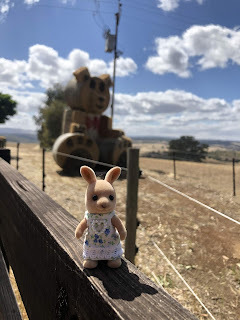 This week my daughter & I went to the annual Doll & Teddy Bear show. This years show was only small, but they still had very well made entries, & enough trading stalls to make it worth while. The competition theme was "A Night at the Opera"
My favourite entry, a miniature room box. My Daughter is a teddy bear fan, & there was a trader there who makes all her own Teddies, she said she has about 400 in her house! This is a joint story by myself & my 5 year old & 2 year old sons. suddenly there was a loud noise nearby & a car appeared through the bushes! & then there were more! Poor Opal was so surprised she fell flat on her face! Opal & winter decided to move away from the noisy cars. Look it's a giant hopscotch game, the squares are bigger than we are! What on earth is that!!! Opal started climbing a tall tree. "Winter, they won't be able to reach us up here." "Um Opal, are you sure about that?" "Mm, I might have to rethink this!" "Let's walk through this long grass & maybe they won't follow us here." "look I found a mushroom"
"Actually, I think it's a toadstool..."
"Here is the tallest, most difficult to climb rock, surely those cars can't get up here! Or can they?..." "Please Stop running away," said the cars "We just want to be friends."